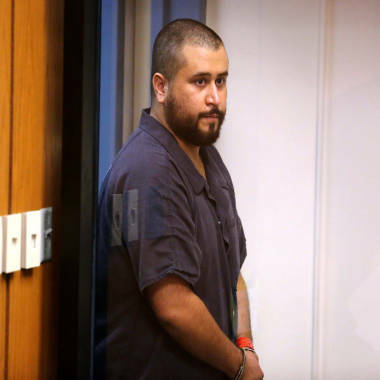 George Zimmerman during a court appearance last week. George Zimmerman possessed five guns — including an AR-15-type rifle — when he was arrested last week and accused of pointing one of the weapons at his girlfriend, according to documents released by police. The other firearms included a Keltec shotgun and three handguns, and Zimmerman also had 127 rounds of ammunition for the weapons, the papers say. Zimmerman — who was acquitted over the summer of second-degree murder in the shooting of unarmed teen Trayvon Martin — was arrested Nov. 18 and charged with aggravated assault after a confrontation with Samantha Scheibe at a home in Apopka, Fla. He was released on $9,000 bond and told he could not have any firearms. He entered a written plea of not guilty, and his former lawyers said last week that they expected he would be cleared of any criminal wrongdoing. Scheibe told police that she and Zimmerman were "involved in a verbal altercation that turned physical,” the police report says. She said that when she told him she was calling police, he pointed a shotgun at her, asked her if “she really wanted to do that,” then broke a table with the weapon. Zimmerman’s version was that Scheibe "began to argue and throw his belongings around the house," the documents say. He said she “picked up a couple of his firearms [a handgun and shotgun], throwing them onto the living room floor.” In his 911 call, he denied displaying a gun and said she broke the table. During Zimmerman’s initial court appearance last week, a prosecutor said Scheibe told authorities that he choked her during an argument a week and a half earlier and that he had threatened suicide. His lawyers said he did not appear suicidal. In September, the police chief of the Florida town of Lake Mary, where Zimmerman had lived, expressed concern that he was allowed to carry a gun. “I’m a small-town police chief. If I had the authority to revoke his firearm license, I would certainly sit down and consider that,” Steve Bracknell told NBC News. Days earlier, Zimmerman’s estranged wife, Shellie Zimmerman, had accused him of threatening her and her father with a gun during a dispute over belongings. She later said she had not actually seen a gun, and he said that she attacked him. No charges were filed. When Zimmerman pulled over by police in Augustfor allegedly speeding, he told the officer he had a gun in his glove compartment, police said. Zimmerman, 30, a former neighborhood watch volunteer, has been a central figure in the national debate over guns since he shot Martin, 17, when they crossed paths in a gated community in Sanford, Fla., on Feb. 26, 2012. A jury acquitted him in July.